I think I put Zack over the edge today when detailing all the trials and tribulations of my woman problems this month. It's hard though when your boyfriend is your only friend within a 1000 mile radius. It's just that over the past few months I've been experiencing some severe PMS. I was in Bakersfield last night and, for those that haven't had the joy, it's not the nicest place to visit in CA. The hotel I was staying at was a shithole that reek like butts and had a rickety faucet. I went out in search of a grocery store or something for dinner that didn't come with french fries. What I found was a bail bonds store, a funeral parlor, a Frosty King, and about a million car dealerships. I came back to my hotel crying over my bad luck and even worse accommodations. I blame my intense emotional reaction on pms. All day today my pants have been tight, my back aching, my head throbbing, and I can't seem to stop ingesting food either covered in mayonnaise or chocolate (and I normally hate mayo!). Sometimes it's just hard to be a woman. So, I've also found that after 3 months of intensive traveling and working non-stop that I've been neglecting my body. I've been eating out way too often and not finding healthy alternatives nearly enough. Working out has become but a distant memory in my daily routine and I've been smoking butts like a champion. But, I've got one more week left of traveling after this one. Then, I'm working at home for the rest of the month. I'll be traveling home for one of those weeks so I guess I'm really only working from home for a week and a half. BUT, I've got to get on track in that week and a half. I want to get my healthy bod back! Yesterday I got us all fixed'em'up with wireless. Now I can type away and surf whilst watching the Pats on our comfy new couch. It's so nice not to be tied to the desk! The best thing about this new technology in our house is that we can both be working online at the same time. I'm on my way to Fresno, Bakersfield, and San Luis Obispo this week for work. It's going to be a long and busy week with lots of traveling between visits. Hopefully, my rental car will have a cd player. I've lucked out the past few times I've rented cars and have been able to upgrade for free. This time it would be key. I'd much rather be driving around central CA in a convertible or a sports car rather than a Ford Focus or something similar. I've found that traveling for work takes a lot more planning than I had originally anticipated. Not only do I have to figure out what I'm going to wear for 4 days along with jewelry and shoes, but I also have to plan for everything I'm going to need for work. It usually takes me a whole day just to get everything all set. Hopefully it'll get easier with time. Well, I guess I'll get to fixing up some Thanksgiving leftovers for lunch. One thing I really love about Thanksgiving food is that you can fill-up your plate and mix everything together and it takes amazing. Who'd have thought turkey mixed-up with green beans and squash would be so tasty! So I wrote this whole long post about how having Thanksgiving with friends and your loved one is so amazing. It waxed poetic about the giving of thanks, about being grateful for all that we are blessed with, and about the joys and wonders of being able to spend a whole day in the kitchen chopping, baking and basting. It was lost though so I'll just list the all the epicurian creations that my dear friend Kate and I made this Thanksgiving. We spent the whole day in the kitchen dancing, cooking, and drinking. It was lovely. The day culminating in our big feast complete with friends, candles, and inappropriate dinner converation. I couldn't have asked for more. I felt so blessed to have spent this holiday with good friends. While it was hard to be so far away from our families, it was so good to be in the company of our chosen family. 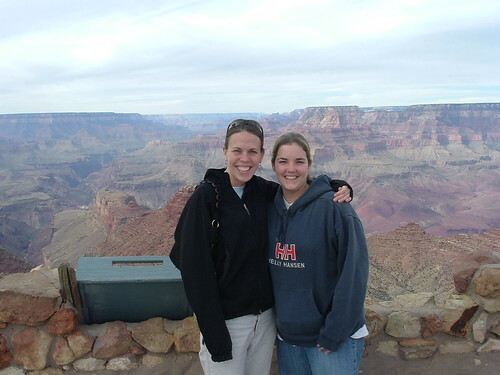 The day before Thanksgiving we drove up to the Grand Canyon. 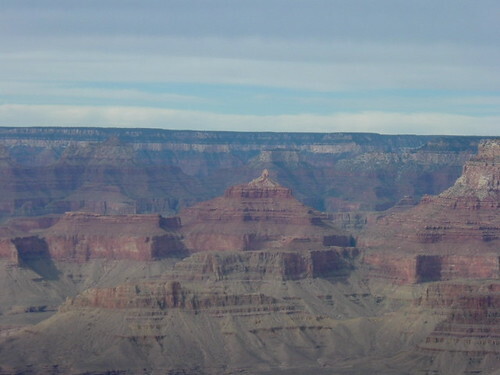 I love the Grand Canyon. 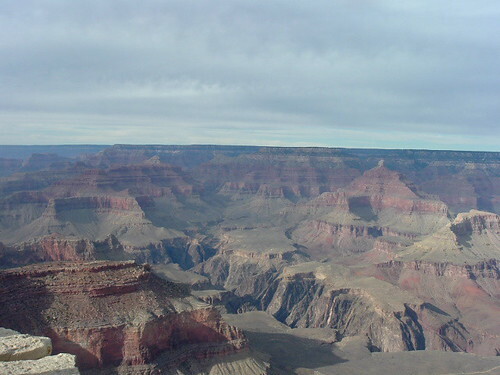 It is a sacred place that I have treasured since the first day I stepped foot on the rim. It's very hard to describe the vast depths, the intense and definied layers of color, and far reaching opposite rim. 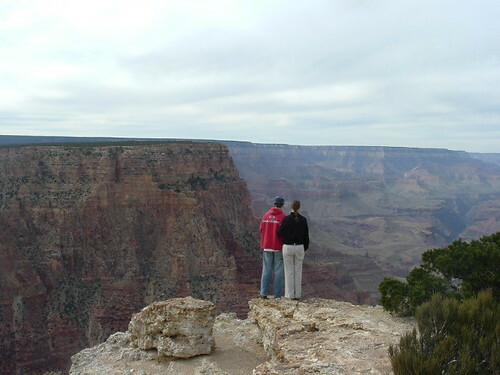 It was Zack and Kate's first time at the canyon and I was thrilled to see their experssions and their wonder at what could create such a vast and beautiful natural wonder. Next time we go, we will definitely plan to spend a few days hiking and/or rafting. It's not a place you can experience fully from the rim. Below are a few pictures from our little adventure. So it turns out that Arizona has one of the highest rates of identity theft in the US. I guess I can understand it as crime here is so over the top and everywhere you look. I went to the band to open a new account with my first check from my new job. My old NH bank doesn't exist out here unfortunately. Well, turns out that for the first month of my account they put a hold on every check I deposit. This means that I can't access my money for a like 2 weeks! Geesh! It seems a little over the top. I wish I had realized this sooner because now I'm broke even though I've got money in my account. At least it's Thursday (and my birthday) which means I fly home tonight. Santa Barbara is awesome and I'm so glad I've had such a productive time here in such a beautiful place. But, I can't wait to get home to my little love nest where I can unpack the 10 boxes of books that arrived while I was gone. I'm looking forward to laying out by the pool and maybe playing some tennis with my sweetie. However, it looks like we might be having Spamish Rice for Thanksgiving if I don't get this money situation figured out! I smelled Sequoia today for the first time. The scent is overwhelming, fresh and a little nutty. I wish my camera worked so that I could take pictures of all these new surroundings. Santa Barbara is a beautiful town. It's a lot like Portsmouth actually but in a very West Coast way. The streets in town are lined with posh shops and restaurants. There was a Farmer's Market going on today, musicians on the streets and people everywhere. The salty sea breeze takes me home automatically. I knew I was going to miss the ocean living in Arizona, but I didn't realize how much I missed it until I smelled the sea breeze here this afternoon. I miss the salty coves and sea life of the New Hampshire coast. I miss standing on the beach with my feet in the sand and the surf rumbling below. I've got two more busy days here and then it's back home! Long time, so typey. So sorry! I have been busy, you see, very busy. When we last talked I had accepted the new job and was planning the move to AZ. Well, here I am! Scottsdale is beautiful! Zack and I are living in a perfect little one bedroom. It's definitely a big change moving from the quaint streets of New England to the palm trees and cacti of Arizona. While I miss it intensly, there is a wide wonderful world to explore out here. Everything is SO BIG! The mountains, the sky, the canyons, the desert. It's breathtaking. I've got a ton to share and it will all come out in time. I'm already on the road for my job and have a lot of traveling in front of me for the next few weeks. In the midst of learning a new job, unpacking, reveling in newfound bliss of my domestic partnership, and traversing the wild canyons of the southwest I will update my little blog with new pictures, stories, and words. Much love to all the readers who haven't abandoned me just yet!